You are evangelists, altar guild folks! You are the preparers and keepers and transmitters of some of the coolest stuff we have in The Episcopal Church. Children and teenagers and the adults whom we are attracting to Jesus Christ through his Episcopal Church are very curious to know more. These new Episcopalians are attracted to us because of our timeless worship and ancient traditions. They are attracted by a faith that wasn’t invented yesterday and by creeds and prayers that bear the test of time. Our newest family members are attracted by the rich sacraments that we celebrate. Our newest Episcopalians are interested in evangelism from the sacristy. If you have been a part of The Episcopal Church for some time, it can be easy to forget the curiosity and wonder that newer folks have for our tradition. Each Sunday, I interact with new Episcopalians. They are curious to learn and to question and to grow in their understanding. I get asked all the time by altar guilds about how to attract younger and newer folks into this valuable ministry. In my opinion, your best new prospects are in our confirmation classes. Ask the priest in your church if you may sit in on at least one session of confirmation classes. Better yet, offer to your priest to contribute to confirmation classes, giving a short tour of the sacristy and the church to show and tell and to answer questions. Our newest Episcopalians are thirsty to know more about the why and the how of worship practices and traditions. As sacristy evangelists, you are just the perfect folks to share this knowledge. • Open up the closet filled with colorful chasubles and explain the meaning of each color and each season. • Unlock the cabinet where the silver or pottery is stored and tell stories about the history that they are now a part of. • Slide open the “junk drawer” (come on, all sacristies have them) jammed with floral tape, a needle and thread, a cheap Bic lighter, scissors and a few dried up palm crosses. • Set up the vested chalice (the stack) explaining the names of each item. • Tell funny stories of grace, stories about when something went wrong during the worship service and, yet, how all was forgiven. Most importantly, tell people that altar guild work is not a job. Tell folks that altar guild work is a ministry, a ministry where you are gifted with a rare window into the majesty and serenity of God. Tell people how you encounter Jesus while touching and preparing holy things. You are an evangelist! My wife and I have two sons, both of whom are in their early 20s. We raised our sons in The Episcopal Church. The greatest memories that our sons have of growing up in the church are not from EYC or a youth group. 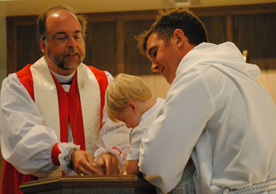 The greatest memories our sons have of growing up in the church largely have to do with behind the scenes ministries, with altar guild and acolyte work. Our sons can remember sitting in the parish hall next to older ladies with gnarled hands who patiently showed these little boys how to fold a palm cross. Our sons laugh when remembering all the mishaps that can happen when a thurible can never seem to light. They remember teaching a young acolyte how to get that tricky candle on the left to ignite. Our sons know about Christian worship and traditions because an older adult invited them into the sacristy and treated them as if their gifts mattered. Our sons are Christians partly because of sacristy evangelism. 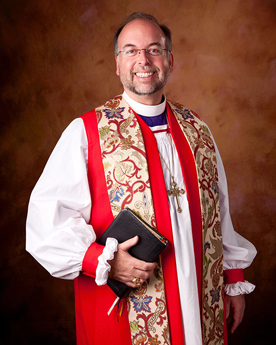 Therefore, invite new Episcopalians into your work and ministry by pulling them into the sacristy with you. Involve children and teenagers who are also hungry to encounter God through worship and tradition. Open up the sacristy and open your mouths with the good news that you have met Jesus Christ while preparing his Table. You are a sacristy evangelist!